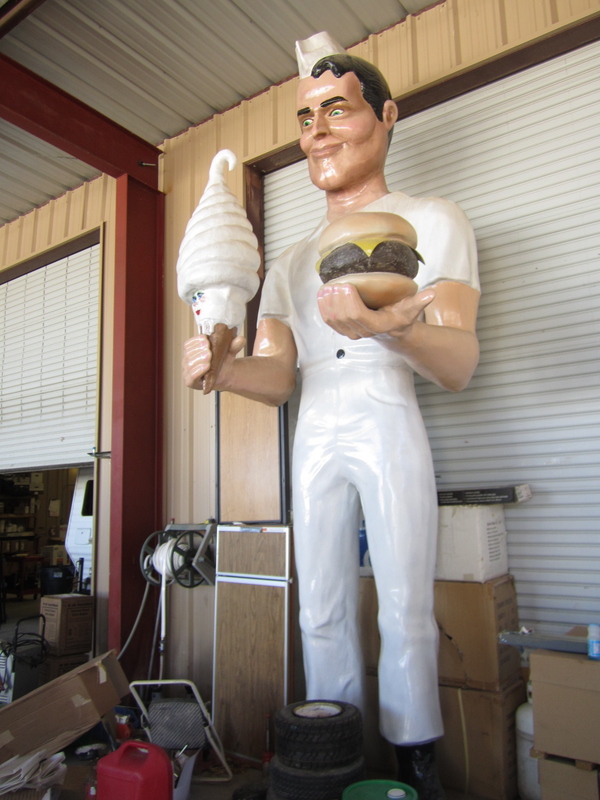 This blog happens to be coming out appropriately right after the release of the first episode of American Giants that covers this soda jerk found in Macon, IL. 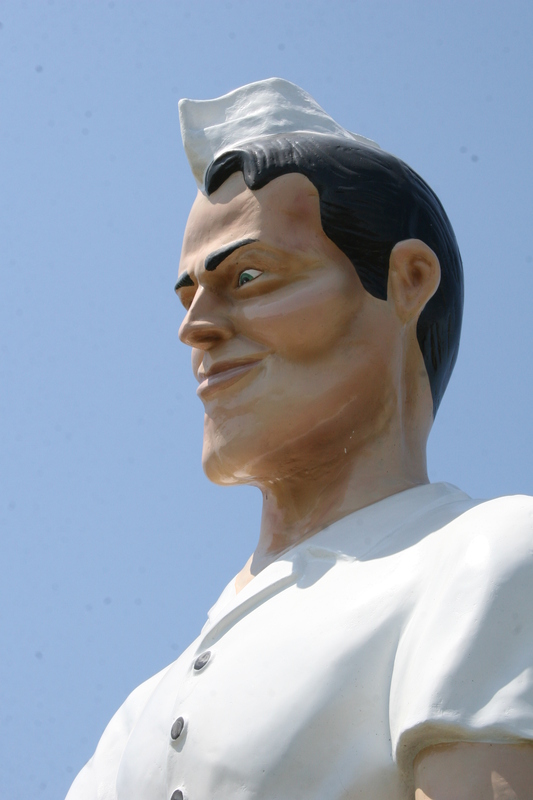 I have created a slightly confusing situation by referring to this muffler man as both the Macon and Decatur soda jerk. 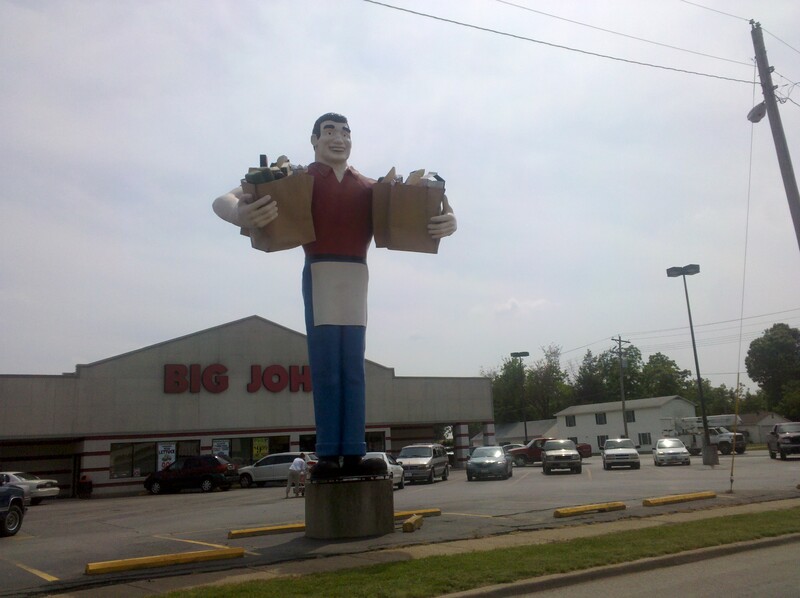 There is only one and he is actually in the small town of Macon which is just south of the much larger town of Decatur. 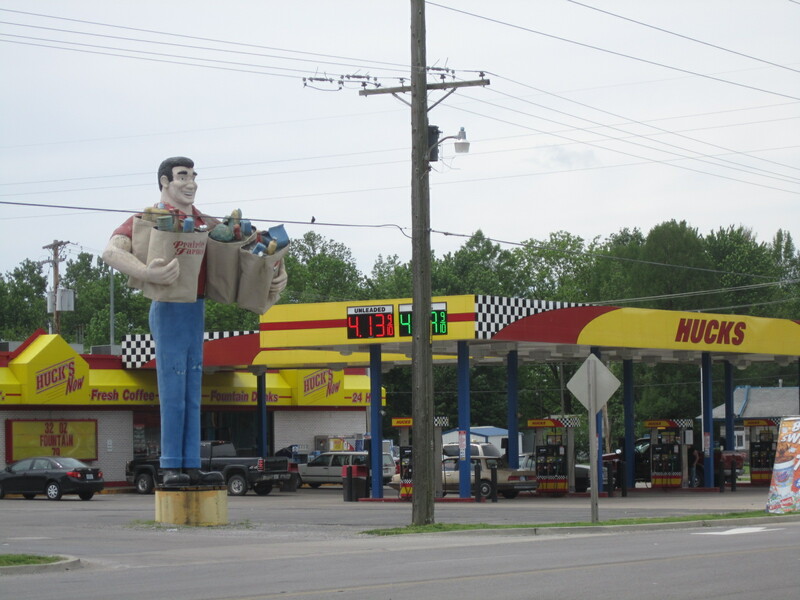 As I mentioned in the episode, he stands in the middle of a field along highway 51 and the business he apparently was ordered for stands empty and unfinished behind him. 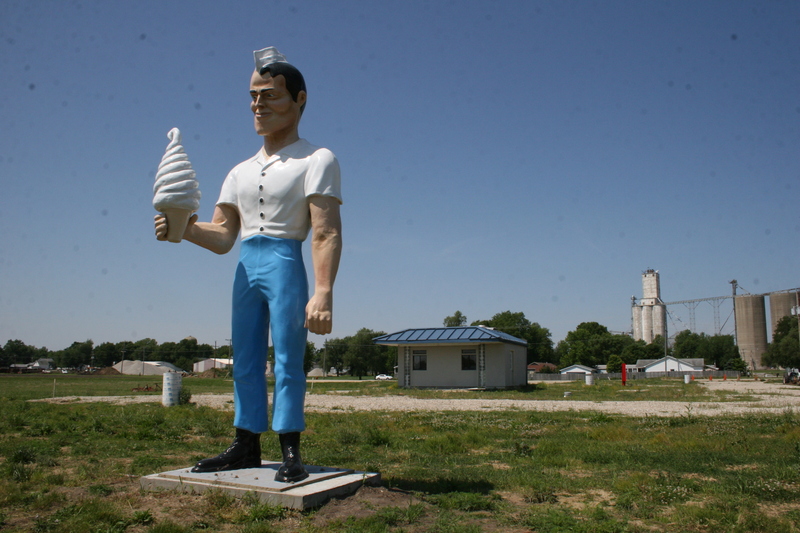 He has been standing here holding his ice cream for a few years now and it is unknown what will become of him. 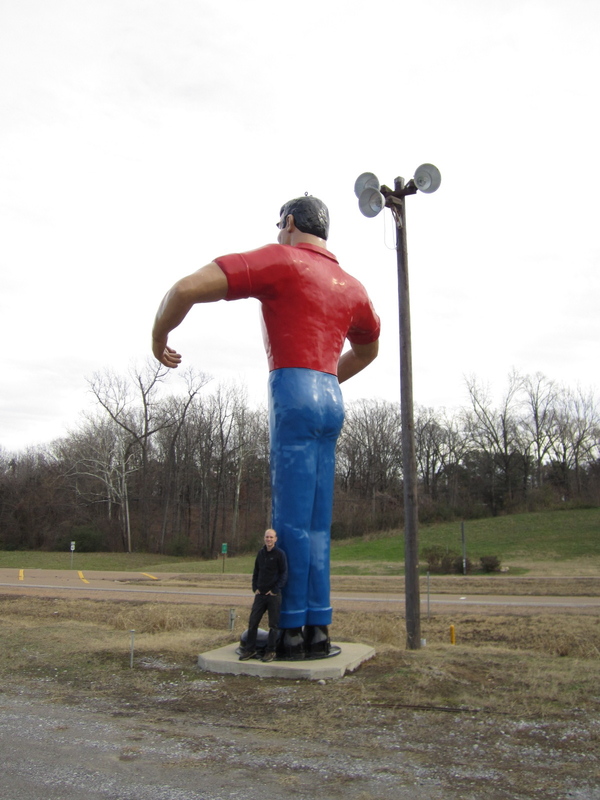 He is defiantly one of Mark Cline’s creations made from the mold he cast from a 15 ft muffler man. 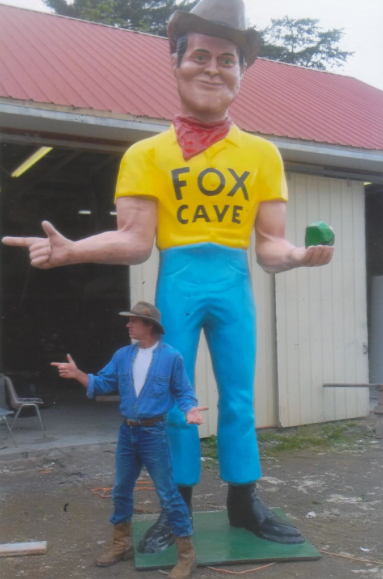 Mark continues to make soda jerks and cowboys, all variations of the original lumberjack from International Fiberglass. 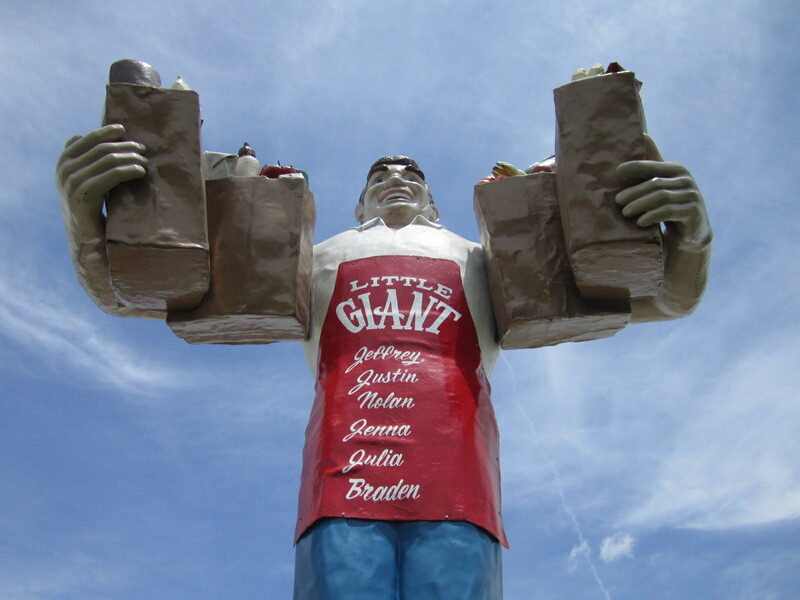 This one has one hand down at his side and the other in standard muffler man configuration. 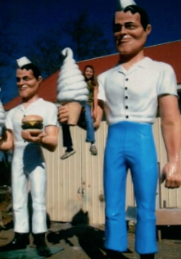 The soda jerk found in Derby, NY was made about the same time as this one and is almost an exact copy except that one is holding a burger as well. Check out the blog on Mark Cline for allot more information on him and these soda jerks. 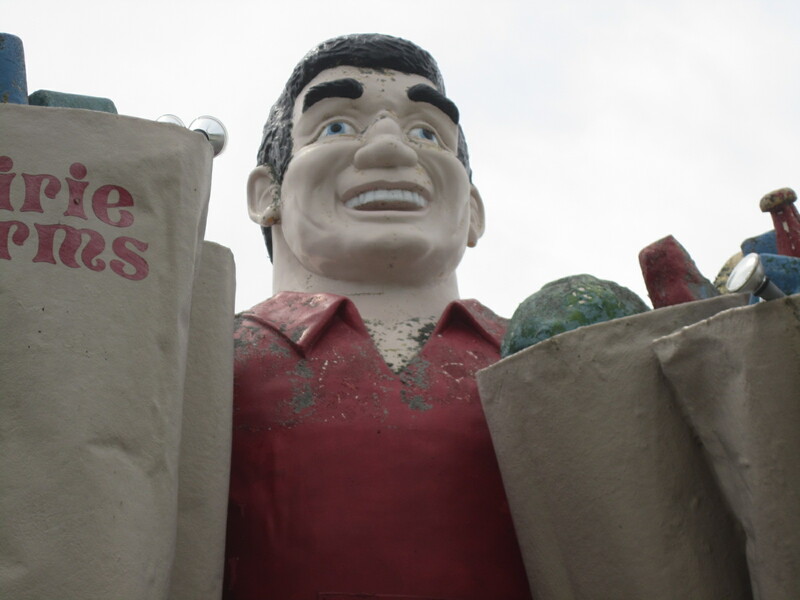 While visiting the muffler man in Hatch New Mexico I was in for a real surprise when I walked inside to talk to the lady in the office. By now she is fairly used to the visitor simply there to see Teako Nunn’s collection of fiberglass figures and there is information scattered around the room you can read about his various pieces. cream cone standing about two blocks from the town center at a small cafe. I believe this is the first time the Soda Jerk came on the scene and how he was made and got there is still a mystery, at least to me. 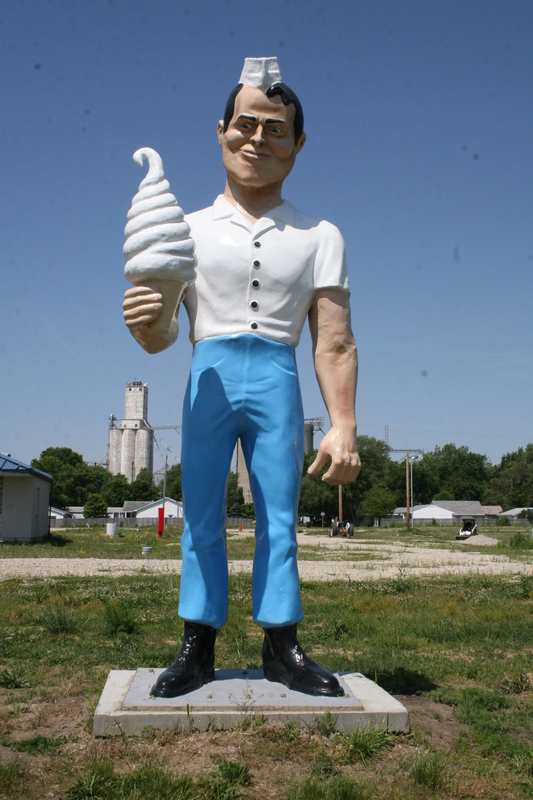 By 2000 he had been moved to Natural Bridge and stood on highway 11 at an ice cream stand called “That’s It”. 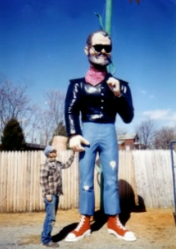 The next time he showed up was in 2004 and by this time he had been captured by the artist Mark Cline and stood at his “Enchanted Castle Studios” in Natural Bridge. 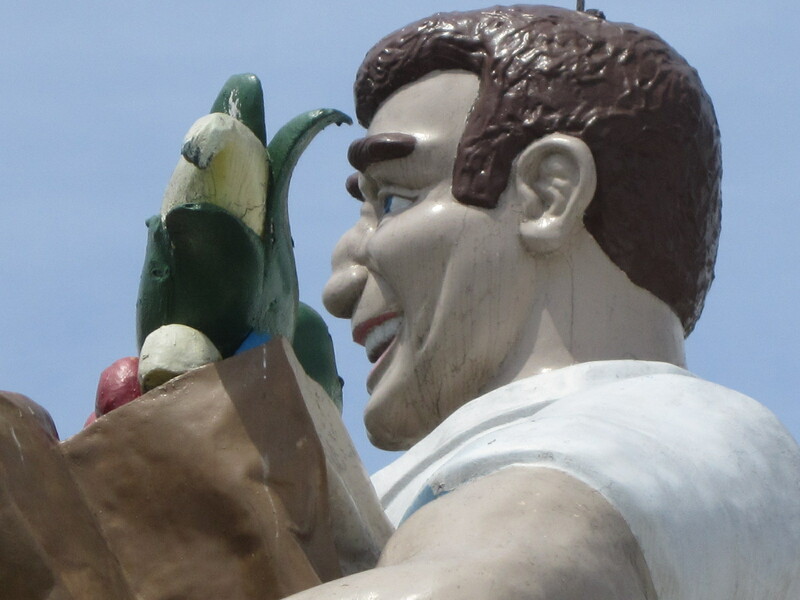 I have yet to make my way to Virginia on a muffler man trip so I have not met Mark yet and when I do hopefully I can get more of a scoop on his ice cream guy. 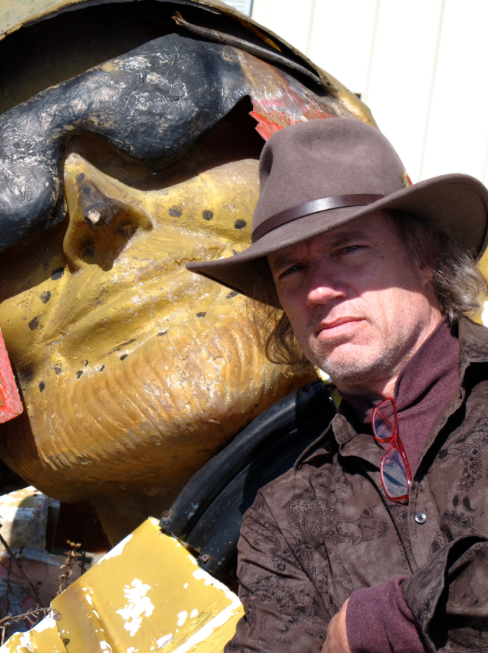 (npi) Mark is a artist and entertainer who is inspired by science fiction films and his work is featured in the first episode of American Giants. 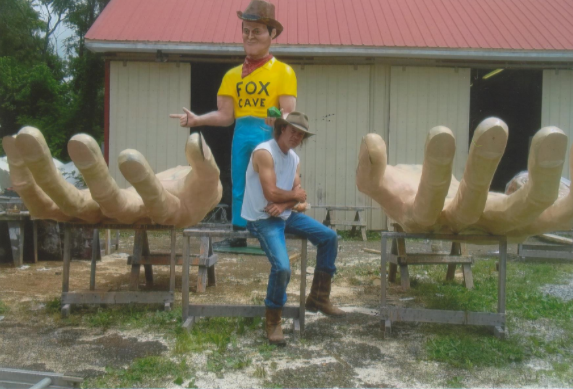 Mark makes large foam and fiberglass figures for attractions and his work has slowly been expanding across the states. He has made hundreds of creatures and dinosaurs and also seems to provide a home for other fiberglass figures that he has not made. 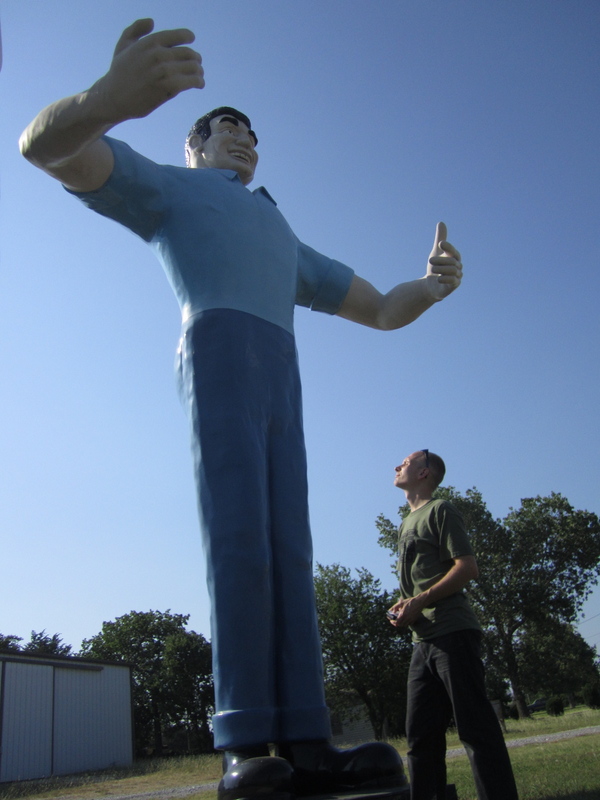 Years ago he got his hands on a 15ft muffler man version and made a mold from it. Since then he has been making his own version of muffler men that we call soda jerks. He smoothed out the chin for the new models but not before making one copy of the original Bunyan head. 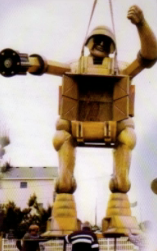 Years ago it adorned one of Marks creations, a 20+ foot tall battle mech. Today just the head, helmet, shoulders and the star goggles are left. The soda jerk however had a brighter future and Mark went on to make copies of it and eventually started selling them on e-bay. I know of 3 so far, my #43 sighting in Decatur, IL (white shirt blue pants and arm to the side) another one in Derby, NY at the Super Freeze ice cream store and finally this one in Hatch. 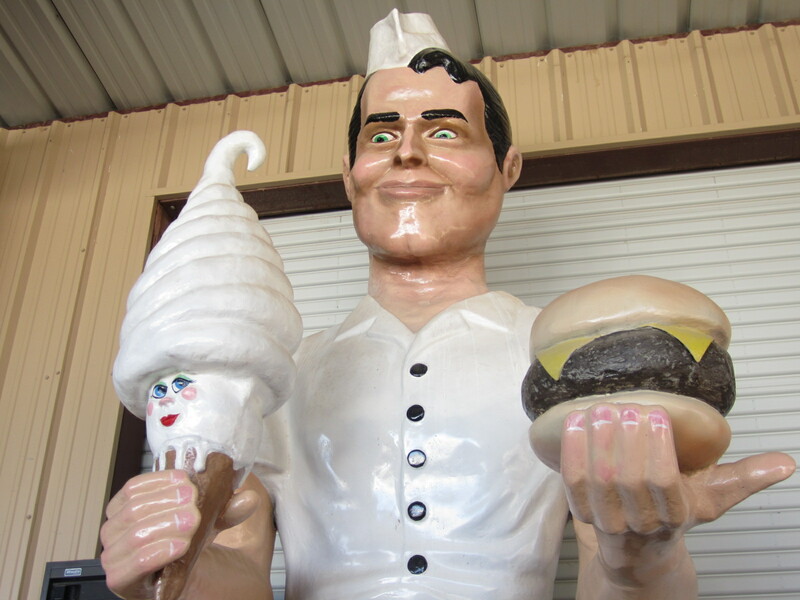 I had heard about Mark by the time of my visit to hatch and figured this was one of his creations since the original Roanoke soda jerk had a left hand that faced down and this new arrival had an ice cream in his right hand and a burger in his left! Mark also has made a cowboy variation that stands north of Cincinnati. 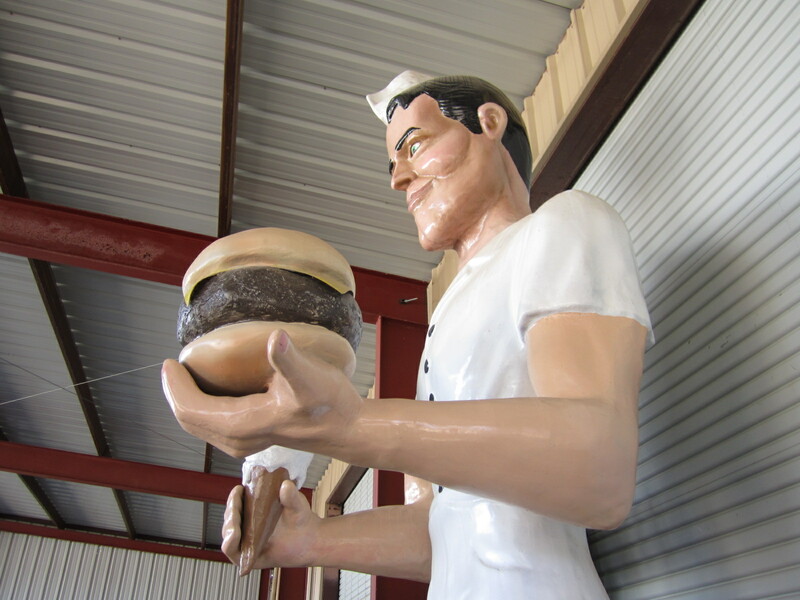 The reason all of this counts as a muffler man sighting is because somewhere somehow in the Roanoke soda jerk’s history he came from international fiberglass. 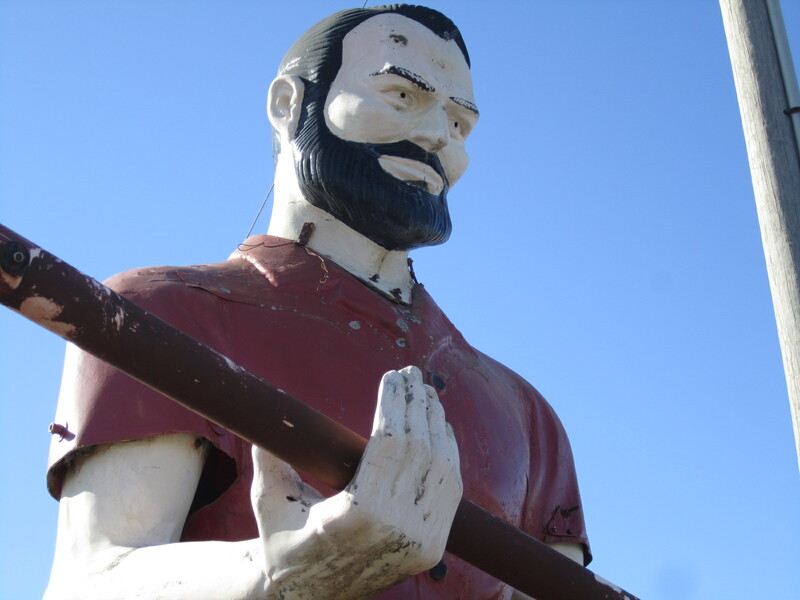 His mold is a copy of the shorter bunyan that international fiberglass made although he has a different head then the bunyans. 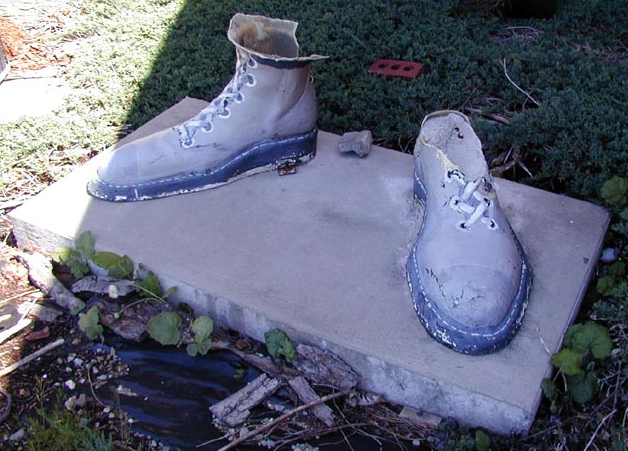 Since my visit to hatch the soda jerk has been moved outside by the road for others to see and enjoy.